Notes: Volume 22, Number 7, Issue 214 Price on cover include %5.95 Canada. Earlier issues credited the Publisher & Editor. This issue credits a Publisher and a News Editor. The editorial is written by the News Editor (and prior publisher and editor). 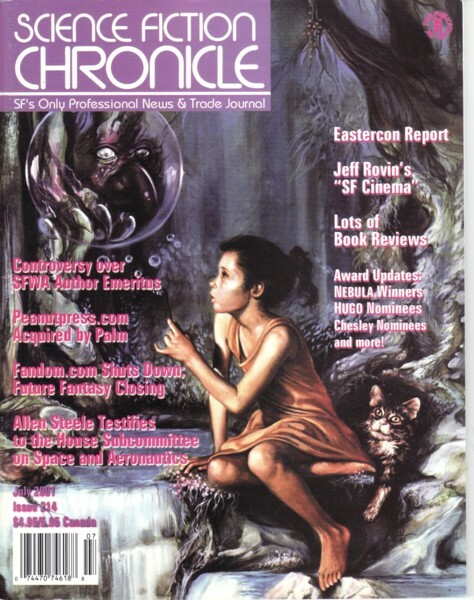 It claims that "I'm not really the editor of SFC any more: Warren Lapine is.". In later issues (possibly #216, definitely #217), Warren's title becomes Publisher and Editor in Chief. Cover credit: "Enigmatic Encounters" by Jael, copyright (c) 2001 by Jael. Page numbering for this issue starts with page 1 on the contents page, the first inside page (does not count the front cover, inside or out). Page numbers for content will use the printed page number. The "UK Report" is a credited sub-section of the "Headlines". There is a 16 page insert stapled into the middle of the issue, using thinner brown paper. It is the Wildside Press Spring 2001 Catalog. The pages are numbered separately 1-16. The Ron Walotsky interview "first appeared in The Paper Snarl #16. The review "Journeys into Limbo" gave the title as "Surveys into Limbo". The review "Refugees from Nulonqwe" gave the title as "Refuges From Nulonqwe". Published in April (sometime) by Scifi.com. Title should appear if/when those issues are entered. The review "Jour de Fête" gave the title as "Jour de Fete" The review "The Precipice (Part 1 of 4)" gave the title as "The Precipice" The review "Wound the Wind" gave the author as "George Zebrowki" The review "Bending the Landscape: Horror" gave the title as "Bending the Landscape: Original Gay and Lesbian Writing: Horror" The review "The Last Harbor" gave the title as "Last Harbor" The review "Avatar Book One of Two" gave the title as "Avatar Book One" The review "Avatar Book Two of Two" gave the title as "Avatar Book Two" The review "Kings of the Jungle: An Illustrated Reference to "Tarzan" on Screen and Television" gave the title as "Kings of the Jungle". The review "Nebula Award Stories Two" gave the title as "Nebula Award Stories 2" The review of Snake's-Hands: A Chapbook about the Fiction of John Crowley" gave the tile without the hyphen. The obituary for "Donald A. Reed" was titled Donald Reed and gave the name as Dr. Donald Reed.